Say this with me, rolling is not difficult. In fact, rolling is easy. This is the second biggest hurdle to rolling, the mythos. I have mentioned before that I went to the East Coast Kayak festival earlier in the year with a friend who is a white water paddler. We went to see Ben Lowry tech a dryland rolling class. Having a friend who is a whitewater paddler was and is a tremendous advantage when it comes to rolling. He offers a very different perspective. In whitewater kayaking, everyone rolls. You just do it. You have to do it. And since everyone does it, no one is afraid of it. I am no amazing physical specimen. If I can roll a kayak, you can roll a kayak. The other part of the 'rolling is hard' mythos is this. 'my kayak doesn't roll easy'. If your paddling a touring kayak, it rolls easily. And if you have seen Dubside do a rolling presentation, then like me you have seen him roll a very wide recreation kayak, and do a Greenland roll no less. In fact Dubside hands out a brochure called something like 'Don't blame your kayak'. So if it is easy, and it's not your kayaks fault, whose fault is it? It's ours. We get it so built up in our heads that it is difficult, added to the fact that we are upside down in water, and it doesn't happen. If you think you are going to fail, you are going to fail. That lesson isn't even Buddhism, or Martial Arts, it's basic psychology. Rolling should be, and is fun. You should be having fun with rolling, like any other part of kayaking. But as soon as it becomes a chore, or a challenge we lose that perspective. So we were at the East coast kayak festival, looking around the tent that Ben Lawry was teaching in, and I elbowed my friend. I said, look around. We were surrounded by middle aged paddlers who had decided that rolling was hard, and subsequently they had a hard time doing it. Ben made rolling look easy. Earlier in the day Dubside made rolling look easy. You know why? Because rolling your kayak is easy. And should be fun, like this. Sea Kayak Roll-a-palooza 2009 from Brett Friedman on Vimeo. Some call it the ladder, some the call it the rodeo, some the scramble. Either way it is a fairly simple method to get back into your kayak, after you have wet exited. In the Fall back scenario for me, it is my first go to after a missed roll, and a wet exit. Near the rear of your kayak, push down to submerge it, and scramble your chest onto it. As you slide forward you will move onto a wider section of deck, the kayak will be less submerged and more stable. This is a good time to get your legs on both sides of the hull. You can stay with your chest to the deck or you can sit up. Keeping your feet low, they act as a good counterbalance, because you are sitting on top of the deck raising the kayaks center of gravity. then just work your way forward. Here is the trick, at least for me, if you try and put your feet in the cockpit, before your bottom, you will fall over and have to start over. Put your bottom in the seat, and then bring your legs in - similar to the way I enter the kayak in the 'entry' video, this may be harder for those of you with longer legs. Once your legs are in the kayak, skirt up, pump out the kayak, and you are on your way. I put this as my second option after rolling, because it is fast - if it works - and doesn't require any extra gear. For me it generally doesn't work. The other thing I should point out, is if your kayak has a skeg, you can enter from the rear, which is much easier than if you have a rudder, and have to enter from the side. The reason for this, is that the rudder and it's fittings are metal, and have the potential to cause some damage - to you - which is enough to make a bad day worse. When ever you are in the water, for any reason, in proximity to your rudder be very careful. The video below is one of my favorites. And it's not one of mine. It is an excellent demonstration of the rodeo re-entry. Even better, it's done in rough water. This brings up a valuable point. Practice in rough water. Practice rolling, and paddle floats, and edging, practice everything in rough water. When something bad happens, chances are it's going to occur in bad weather. People tend to practice rescues on beautiful sunny days. This is not when your going to need to do a rescue. The practice is still good, but it would be much better if you could throw in a little wave and wind to get the feel of it. An Awesome resource. I was honored by having my forward stroke video featured in an article, I didn't realize I did a racing/hybrid stroke, but I will take his word for it. See the blog for the article. But just scope it out, as I said, an amazing resource. I formerly lived a short distance from the Hudson River in NY state, and for four years it was my primary paddling location. Before I lived there it was the site of my first over night paddling trip. I paddled from Poughkeepsie NY to Lower Manhattan where I lived at the time. This blog is a paddler doing an amazing route down the Mississippi, around Florida, up the Coast, then the Hudson, and finding his way back to the start via the Great Lakes. Currently he is in my old stomping grounds. I have become enamored with paddling in Scotland. I had no idea that it was so beautiful and that there was such a rich tradition of kayaking, and so many highly skilled kayakers. I like this, this, and this, and check them almost daily. Enjoy. I have been very busy. Like everyone else, my time runs short, and of course the things that fall by the wayside are paddling, and my dojo. At my dojo I have classes on Monday and Wednesday night. I have had some changes at my job, and while they used to protect Monday and Wednesdays so I could go to the dojo, that situation has changed, and I go intermittently at best. Lately once a week, but for a few weeks, I missed class altogether. Yesterday I happened to be off all day, and while I had planned to paddle, a car repair got in the way. But I was able to go to the dojo. In fact, I got to class thirty minutes early, only my sensei was there, and I did a nice stretch, and then did my kata, as the classes I have been to there has been no kata instruction. I felt rusty. It is amazing that you don't feel 'rust' forming when you don't do something, but I felt the accumulation of several weeks of rust in my movements. Things that normally flowed, didn't. I couldn't stand on one leg and throw multiple kicks the way I can when I am practicing diligently. I also have been to busy to regularly paddle. I did a few rolls the last time I paddled and really needed to think about keeping my head down which is not normally the case. Normally, it just flows. Like kicking twice while balancing on one leg. While it is important for our psyche to be active doing the things we do, it is also important for our skills to keep doing the things we do. Practice, must be more than practice, it must be ritual. It is good for our minds, it is good for our bodies. It is good for our skills. I like this quote about practicing meditation. Even the most seasoned meditator continues to practice seated meditation, because it tunes and sharpens the basic mental skills he needs for his particular game. We must never forget, however, that seated meditation itself is not the game. It's the practice. The game in which those basic skills are to be applied is the rest of one's experiential existence. I read that as 'don't practice for practice sake' Practice to apply it. Practice AND apply it. I am taking the next week off to travel for my birthday. 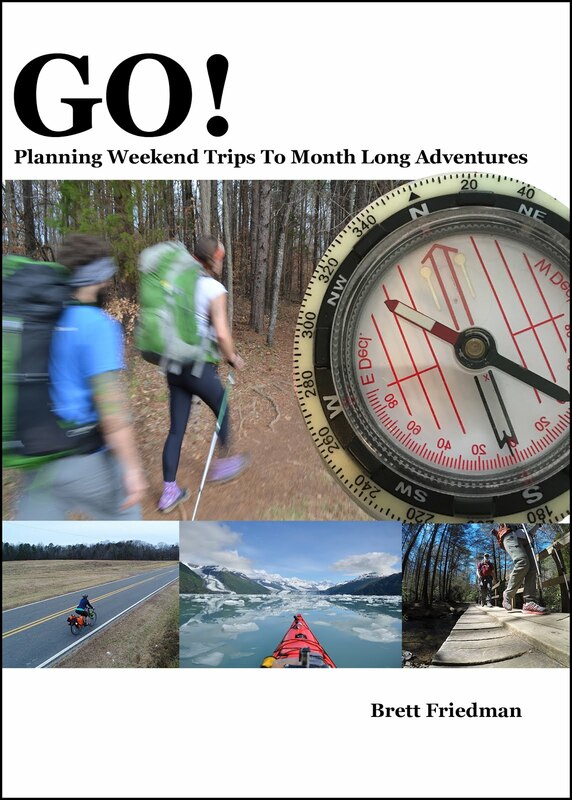 Hiking and camping, not paddling. But I will have some little posts to fill the week. While I am gone, paddle. If nothing else, just get in a boat, and enjoy it. May be even, practice. I want to step back just slightly, a commenter (Andyb) got me thinking, as he is new to paddling he is still working on basics. Actually I think we are all working on basics, but I digress. And in responding to his comment I had a thought I want to share. When I started the blog I decided I would include video as much as I could. The arrival of my Gopro hero HD only added to that desire. I have a great deal of fun mounting that camera all over my kayak and paddle. But there was an unexpected side effect to all that video. I got to watch myself paddle really for the first time. And I have to tell you I saw things I didn't like. I saw my Hands tend to drop on my forward stroke when they should just move across my face. I saw that I EDGE my boat constantly to make many small adjustments, I think I probably over correct. When I draw, and scull, I don't get my paddle vertical enough, which I think may be in part to my short arms, or I just may be lazy. I don't know why I didn't think of critiquing myself through video before this, As an instructor, I watch paddlers constantly and have no shortage of corrections for people, why would it be any different for myself. In the martial arts world, everyone strives for their black belt. It symbolizes - particularly to the laymen - an expert. This is in fact incorrect. A black belt is someone who has mastered the skills associated with that rank, and what that means, is they have the skills and after attaining their black belt they are then really in a position to learn. There are then ranks above black belt. At some point to practitioners that rank becomes unimportant, and it is merely mastery of the skill that becomes the goal. Black belts joke that the purpose of a belt is to hold your pants up. Nothing else, regardless of color. I have mentioned people that I consider my Sifu, and Master. That would imply that I am still a student, And I would bet that they still consider themselves students as well. I feel as a paddler that I am at that point where I don't particularly care about 'rank'. I care about the art, and the practical applications of it. The more I learn, the more I feel I have to learn. When I teach I constantly learn new things. Which is a gift from student to teacher I am willing to accept. If you consider yourself a student of the art, then I have a suggestion for you. Video. Mount a video camera on your kayak, and see how you look. Particularly the forward stroke. If you think it is way too expensive of an option, then check this out. The camera is a still camera that shoots video as well, and is water proof. I am sure there are cheaper options. Actually the non hd hero is only around $150.00 US, the camera I use captures High Definition video in a tiny package that is completely water proof to 180 feet. Shoot video of yourself, and feel free to send me a link, and I will help you critique your stroke. I think this is an amazing way to see what is really going on in and around your kayak. The paddle float reentry is a great fall back unassisted rescue technique. It is important to have a plan in place for when things go wrong. Planning for a failure in the roll is important, Because as we will discuss, so many things can disrupt a good solid roll. Every video on this blog has had a paddle float and bilge pump on the deck of my kayak, in front of the cockpit. It is always there because that is how I was taught by my sifu. In fact he taught me so well, that despite the fact that today I feel that they are on the wrong side - left, I think they should be on the right - I leave them where they are, because when instinct takes over, my body knows where the paddle float is. If I switched it to the right side, my body would have to look for it, and I am not willing to take that risk. The Paddle float reentry is not the fastest way back into a kayak, but it works, and it works well. It doesn't take great strength, I think it takes patience more than anything. Particularly when the water is cold, the instinct is to rush. Which leads to nothing good. I am a big fan of the expression 'slow is fast'. It is never more true than in the water on a cold day. An explanation of 'slow is fast' is that if you rush something, you will invariably make a mistake, and the correction will take longer than if you took your time, and did the correct thing first, slower. I was also taught early in my instruction in martial arts, that if you can do something slowly, keeping in balance, it prepares you to do the same movements quickly. But to do something quickly, doesn't prepare you to do it slowly. You can cheat balance, and precision, with speed. The process for the paddle float re-entry is this. Starting in the water next to your kayak. While holding onto the paddle, and the kayak, remove the paddle float from under the bungies on the deck of the kayak. I wrap my arm around the paddle, holding it next to my body to free up both hands. Place the paddle float on the blade of the paddle, and inflate. Flip your kayak over and insert the blade of the paddle - the one without the float on it - into the bungies the behind the cockpit. Your kayak now has the equivalent of an outrigger to support you. Place one hand on the shaft of the paddle, and one hand on the far side of the cockpit coaming. You should be in front of the paddle, with the cockpit on your side, facing the back of the kayak. You now have two options. Method #1. Press with your hands while giving a kick with your feet, and launch yourself onto the back deck of your kayak. Method #2. While holding the paddle shaft and cockpit coaming, put a leg over the paddle that is acting as an outrigger, and use your leg, and arms to get yourself on the back deck of the kayak. You are now on the back deck of your kayak, Your chest, is pressing down on the back deck, and this is where it should stay, as you slide on foot, then the other into the cockpit. Once both feet are in the cockpit slide your whole body towards the bow, keeping your chest on the deck - and therefore your center of gravity low. When your bottom is in the cockpit, roll your body towards the paddle that is supporting you. Placing your bottom in the seat. If the sea conditions are pretty flat, and you are in no danger of being blown into a situation of danger, you can now take your bilge pump, and pump out the water in your cockpit. If the sea conditions are rough. re-attach your spray skirt, leaving an opening for your bilge pump, pump out the water with the cockpit mostly covered, leaning towards the paddle float. If the water is very cold, climb onto your over turned boat getting as much of your body out of the water as possible while you attach and inflate the paddle float. I learned to do the paddle float reentry in Alaska, and this was the procedure we used because of the coldness of the water. If you position yourself behind the paddle, you have to swing your legs much further to get them in the cockpit, as opposed to entering from in front of the paddle. If you roll away from the paddle, when you are getting back in the seat, you risk rolling the boat, as there is nothing supporting it. This is something I practice twice a year. Once at the beginning of the season, and once at the end of the season. I demonstrate it when I teach it as well. The only time I have ever used it in a 'combat' situation was in the story in the last of this post. I apologize that I don't have a video of myself doing a paddle float re-entry. I may be able to shoot one this week. In the meantime check out this animation. I don't think this is the best version of the paddle float re-entry. It shows the paddler getting on the kayak from behind the paddle - which as I mentioned forces a bigger turn than if you are in front of the paddle. It shows the paddle being held in place, instead of under the bungies - which makes for something more to deal with, particularly as you slide over it. And finally it shows the paddler rolling away from the paddle float. I don't think it is ideal, but until I find - or make - a better version it will have to do. It's the fastest - The quickest method that gets you back into your kayak and paddling is the preferred method, because it limits the amount of time you are in a position of vulnerability. There are very few positions in life as vulnerable as upside down in a kayak. The sooner we get out of that position, the better. It keeps you connected to your kayak - In a bad situation there is nothing worse than getting separated from your kayak or your paddle or both. That makes a bad situation worse. It is relatively quick. It limits the amount of time you are in the water. But it's bad because it isn't that easy to do. I have good balance, and I don't think I have ever successfully scrambled into the cockpit. I generally lose it transitioning into the cockpit because I have to take my feet out of the water - where they are stabilizing the kayak - and put them in the cockpit. Though I haven't tried one in my current kayak. So, what if it doesn't work? I like the paddle float reentry. While it does require a piece of gear, and it would be nice to be able to get back in without needing anything, It also is not the fastest method, but it is a very stable, reliable way to get in the cockpit of your kayak. So I have a series of fall back plans, Roll, rodeo, paddle float. And I have used this progression. Paddling two winters ago, before I got my drysuit, I was alone on a lake working on skills. It was very quiet. The weather was overcast, and cold, 40º. The water was flat and about the same temperature. There was literally not another soul on the lake. I decided to practice some low brace turns, and before I knew it I was upside down in very cold water. Not to worry, I set up my roll, and went nowhere. I set up an extended sweep roll, and still went nowhere. Finally I wet exited my boat. The water, as I mentioned was very cold. My drytop and pants trapped some water inside, so once the initial shock was over, I started to warm up. But my brain said 'get out of this water, it is too cold' and I so I tried a rodeo reentry. I got about three quarters of the way into the cockpit and lost my balance, and was back in the water. I slowed myself down, realized I had plenty of time, reached for the paddle float on the bow of my kayak, and started the process of the slow, but tried and true paddle float reentry. I was back in my boat and paddling within about 2 minutes. Now the part of this that most people don't realize is that normally when you need to call on self rescue, it will be unexpected, and in lousy conditions. Unless, like me, you were trying something that can roll your boat, most people end up in the water, in bad weather when water is rough and they are tired. If you are tired you are exponentially more likely to end up in a bad situation. Fatigue effects balance, judgement and skills. So why do we practice our self rescues on beautiful days? Well, because it's safe. But really we should learn our rescues when the weather is good, but then when opportunity presents itself we should practice these skills in less than ideal conditions. When there is a bit of a wave, or a bit of wind, that is a good time to practice your fall backs. Provided you leave a big enough safety margin. Someone paddling with you to help you out if you get in trouble. Always a safety margin, but always pushing your limits. That is how we grow as paddlers. As I teach them, paddle strokes are completed. In thirty six posts I have gone from the basics through more advanced strokes. Of all those lessons there are five strokes and skills that I think are the gateway to highly skilled paddling. 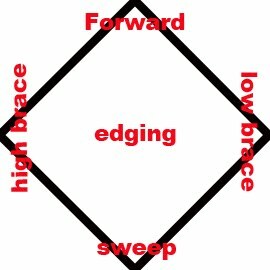 The Forward stroke, Edging, The sweep, The low and high brace. With these five things there are almost limitless combinations that can effect and control the movement of your kayak. I think of them as a diamond with a stroke in each of the four angles and edging in the middle, as it can effect all of them, and influence all of them. If you want to get technically proficient you need to be practicing all of these strokes and edging on a regular basis, and you need to be in a kayak that fits you properly and performs well. You have to learn your limits, and push them, while maintaining a satisfactory level of safety. Which means if you are going to practice low brace turns - which if done improperly will leave you upside down in your kayak - you need to do it in a protected area, with a dry change of clothes in your kayak or in your car. If there is a chance you may end up in the water, on that day you should be paddling with a friend. Practice is something - if you want to improve - that you have to make time for. How much time? Ten thousand hours should do it. I didn't choose that amount of time at random, there is research that shows that to become great at something invariably takes about ten thousand hours. You also have to be willing to make mistakes, and instead of getting angry at yourself, relax into it, and figure out what the mistake was. When I learned how to meditate, focusing on just my breathing, my mind would invariable drift to new thoughts. The instinct is to criticise yourself for not being able to focus, but that in and of itself is another thought. The key is just getting back to what you were trying to do in the first place. This is a skill that we can all use everyday, in any number of situations. I experienced this when I went to the National Whitewater Center. I wasn't upset that I couldn't really paddle a whitewater kayak all that well, I got upset when my roll, which is very good, didn't want to work or didn't work well. I beat myself up over my failures. Not until I thought to myself just relax, and roll, did the roll come back. And honestly I owe that to the person I was paddling with. He got me to just relax into it. The remainder of my afternoon, as I got more tired, my roll was called on more and more frequently, and when I remembered to not think, to just roll, it worked beautifully. I thought to not think, which sounds crazy. But is an important concept. 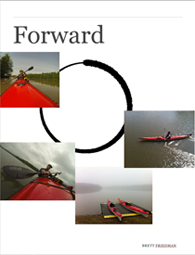 Because everything in a kayak comes back to a forward stroke - because that is where we are most stable, every stroke should put us in a position to do a forward stroke, particularly our roll - that is what I will relate this concept too. I have done three posts on the forward stroke. I would like to do three more, but I fear losing an audience, but it is that important. There are many things to consider in the forward stroke. Body position, rotation, loose grip, pushing with the feet. edge to tweak direction, etc. Only when these movements can be learned to the point that they are forgotten, will they work. they must become instinct, they must become reflex. And to do that, only takes ten thousand hours. Give or take. In the following weeks I am going to transition into rescue skills, then some simple navigation. Following that we are going to take a turn. I am planning a trip for next summer with a handful of friends. The blog will become a chronicle of the planning and execution of an Alaskan paddling expedition. It should prove to be interesting. This is a very simple stroke that can pay off big dividends. It is a stroke performed at the stern of your kayak to begin a turn. It's like giving a push in one direction while setting your kayak up for a pull in the other direction. It fits perfectly in sync with the forward stroke which is where I use it. There are two different ways you can integrate it into the forward stroke. Method #1. At the end of your forward stroke, lift your paddle from the water - do not plant the opposite blade yet - slide your paddle to the rear of the boat as if you were going to do a reverse sweep, plant the blade in the water, and the give a short push towards the bow. You are doing the first six inches of a reverse sweep. Then plant the opposite blade and do your forward stroke as you normally would. Optionally you can add a small sweep at the end of your forward stroke. Method #2. At the end of your forward stroke, in stead of planting the opposite blade, bring the opposite blade to the back of your kayak, and plant it as if you were doing a reverse sweep. Do the first six inches of the reverse sweep - meaning push from the stern of your kayak out, about 6 inches, and then continue your forward stroke on the other side. Optionally, again, you can add a sweep at the end. So the pry starts a turning movement, then you do a forward stroke, and finish it with a sweep which continues the turn. There is no better illustration of integration - which I have talked about before - than these three simple strokes working together. With Practice, all of your strokes can integrate as fluidly and smoothly as this. stern pry from Paddling Otaku on Vimeo. This is a stroke that I don't do often, But when done well is a lot of fun. The hanging draw is used to move the kayak sideways while the bow is still pointed forward. It is good for quick course correction in tight quarters, like a rock garden. Not being a rock garden paddler, I don't use it much, but it is still one of the paddle strokes I practice from time to time. With some momentum, rotate your body to the side you want the kayak to move, so rotate right if you want to slide to the ride. Plant the blade in the water with the paddle shaft nearly vertical. If you rotated to the left, your left hand should be close to the water with your right hand over your head. The blade should be roughly a foot from the side of your boat. You do this stroke without an edge. You can - and will have to - play with both the angle of the blade, and the position of the blade in relation to fore and aft. As both will determine the manner of movement - turning, versus sliding, we want to slide not turn - as well as how much movement there is. This is a stroke that is hard to explain without being on the water. So I invite you to watch the video but then seek out other videos online, I found a few that demonstrated this stroke well, but nothing that blew me away. Actually one did amaze me, until I realized the person was in a whitewater kayak, not a sea kayak. hanging draw from Paddling Otaku on Vimeo. I want to post a brief update to an earlier post, To Rudder or Skeg. This - as I suspected it would - generated a lot of comment and a fair amount of debate. I welcome that debate, and while I feel strongly about my beliefs, I try to be open to other ways of thinking. There is one major reason that I don't paddle a skegged boat, Ease of packing. I am at heart a long distance expedition style paddler. And giving up that storage/ease of packing is my primary reason. The kayak I paddle today was purchased with a particular trip in mind, which will hopefully be occurring next year at this time. That trip will require a massive amount of dry storage in a kayak. I think there are a great many arguments on both sides of the rudder/skeg debate, and I think for many of us one or two will truly resonate. But Yesterday I read something concerning this debate that hadn't occurred to me. It was the 'letter from the editor' of Canoe and Kayak magazine. He pointed out something that I hadn't thought of. Skegs are primarily found on European style kayaks, whereas rudders are found primarily on North American style. These two styles have major differences in both the shape and performance of the boat. The Euro boats tend to be lower volume, with more rounded chines, and more rocker, which adds up to more maneuverability. So I think it would be a better idea to find the kayak that suits you, and then learn the pluses and minuses of the rudder or skeg. I think it is important to keep an open mind, instead of saying you have to paddle one or the other. The important thing is that you paddle. This past Monday was Memorial Day here int he states. For many it is the official start of summer, And this was plainly evident, when I went to the little lake where I paddle when Alone, and shoot all the video (almost) for this blog. It seemed everyone who owned a kayak in the little city that I live, had decided to paddle on the little lake I call my own. In the two hours I paddled I saw only two other touring kayaks. They were old Wilderness Systems Sealution's - which incidentally was the first kayak I paddled on an overnight trip - and their owners were not technically proficient paddlers. But as I looked around me, I saw that no one was a technically proficient paddler. I saw people paddling powerfully with their arms, people slouching in the kayaks. People with hands way above their heads. I saw all manner of kayaking, and they all had one thing in common. They were all wrong. Or were they? I will come back to this. The boats I did see were uniformly of one design. I don't mean that they were all one manufacturers particular model, I mean that they all met a certain criteria. They were between 7 and 12 feet in length. They were all 28 to 32 inches in width. They all had large cockpit openings. They were - in a word - recreational kayaks. This is the majority of the kayaking world. People who are perfectly content to paddle incorrectly for a couple of hours, in a poorly performing kayak, with no clue that there is anything different. No clue that around the corner is another world of kayaking. A world that consists of kayaks from 16 to 18 feet long with an average width of around 22 inches. A world where kayaks go straight when paddled. A world open to over night, or week long, or month long trips. A world where kayaks perform like sports cars. The Sanskrit word for enlightenment is "bodhi," which means "awakened." But awakened to what? The only true answer to the question is to realize enlightenment. Short of that, we must come up with provisional answers that, the teachers tell us, do not really do justice to enlightenment. Enlightenment can be defined as the cessation of dukkha, which is another word usually mangled in translation. It can be defined as the full realization of the truth of the Buddha's teachings. It can be defined as awakening to a great reality most of us never perceive. My teaching defines dukkha as suffering, So enlightenment can be defined as the cessation of suffering. Most unenlightened people don't know they are suffering, it is not until you experience enlightenment that you realize what was wrong. This is how I view recreational kayaks. If only people would listen to me, they would know the beauty, that lies just out of their grasp, that they don't even see. 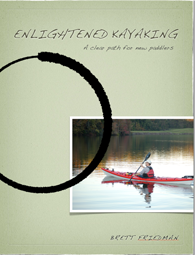 They can't see it until they experience the enlightenment of paddling a 17 foot touring kayak. But are they wrong, are they really suffering? No of course not. They are happy, and enjoying themselves, and at the end of the day that is enough. We have to remind ourselves that we are the minority. We occupy a very small space in the world of kayaking. But we do offer a service. We are they ones driving the kayaking world forward. Forcing manufacturers to find ever lighter, ever stronger materials to make ever more responsive kayaks for us to paddle. We are a small niche, but it's the people in the recreational kayaks that are paying the bills. And for that we owe them a debt of gratitude. The only way we can pay that debt is by helping become better paddlers, if only they would listen. As a footnote, something to consider. If we are the minority, Think about what a small niche the Greenland style paddlers, with their skin on frame boats and wooden Greenland style paddles. We owe them a debt as well, they keep us grounded in the past. Kayaking has a long and rich tradition and it is these people keeping it alive. Kayaks date back 5000 years, which for those of you keeping track is more than twice as long as Christianity has been around.